Tri-Sector Partnerships at the United Nations, Boon or Bane? Tri-sector Partnerships at the United Nations: Boon or Bane? From a certain perspective, the Philippine Agenda 21 (PA21) initiative is only the tip of an iceberg. Aspects of threefolding, albeit imperfect, are starting to take root in many unexpected and unusual places and in many different settings and parts of the world in the form of tri-sector dialogues (TSDs) and tri-sector partnerships (TSPs). These processes are called tri-sector or tri-sectoral because they involve the participation of the three key institutions of society: business, civil society, and government. TSDs and TSPs are also at the heart of what is now being called global public policy networks (GPPN), a new social innovation used by the United Nations and other institutions to tackle urgent global issues. These developments, as we shall see, demonstrate three things. First, threefolding ideas have a relevance beyond the debate on globalization. Moreover, aspects of these ideas are starting to enter, even if mostly in a muddled form, into practical social life at the national and global levels. Second, Philippine Agenda 21 (PA21) is on the right track. Many initiatives are being undertaken that echo some of the important concerns of PA21, especially the proper interaction and relation between civil society, government, and business. Third, and more importantly, the rapid developments on some aspects of threefolding at the highest levels emphasize the need to be able to distinguish between threefolding that advances sustainable development as articulated in PA21 and aspects of threefolding that may actually be a place of co-optation, especially for civil society. In July 1999, the Global Public Policy Project was launched with support from the United Nations Foundation (UNF) in order to support the United Nations reform program. Part of this effort included a U.N. Vision Project on Global Public Policy Networks (GPPN). As we shall see, the U.N. aims to mainstream the results of this project, which involves tri-sector partnerships, at the coming U.N. Millennium Summit. Only a few months before, the U.N. Commission on Sustainable Development had adjourned its 7th Session, or UNCSD 7. The UNCSD 7 continued the UNCSD innovation on threefolding dialogues spearheaded by the Philippine delegation whose Head was at the same time Chair of UNCSD 6. It is not clear whether there is a direct connection between the threefolding dialogue innovations at UNCSD 6 and UNCSD 7 and the reputation of the UNCSD as a leading innovator of social processes at the U.N. But, whatever the internal reasons, the U.N. was convinced of the value of tri-sector dialogues (TSDs) and tri-sector partnerships (TSPs). The Global Public Policy (GPP) Project is one of four components of a larger United Nations Foundation program called "Visioning the UN." The purpose of the GPP Project is to prepare a report on the role that global public policy networks can play in strengthening the United Nations capacity to address the increasing range of challenges posed by globalization. The Project sees the clear link between global public policy networks, TSPs and the on-going U.N. reform program. The Project describes its understanding of global public policy networks and the importance of tri-sector partnerships as follows. Governments and intergovernmental organizations can no longer by themselves dictate responses to global policy issues. The private sector and civil society (including non-governmental organizations, the media, professional groups, and the public at large) have an increasing influence on almost any global issue. In addition, it is becoming increasingly obvious that the active participation of these actors in global issue analysis and resolution is crucial to delivering policy outcomes that are timely, effective, and sustainable-and that can evolve as needed in the face of continuing change.
. . . In order to successfully address todays and tomorrows global challenges, broad networks are required which include all relevant players. . . . Global public policy networks (GPPNs), like the global challenges they seek to address, reflect the underlying forces of globalization, particularly the continued and deep integration of national economies and the information and communications revolution. These networks create bridges on a global scale between: the public sector (national, provincial/state, and local governments, as well as intergovernmental groups); the private sector (business and industry); and civil society (particularly NGOs). The GPP Project describes the kinds of experiences in global policy networks that inspired its efforts and its thinking on Global Public Policy Networks (GPPN) as essential to a new governance approach. . . .There are already a number of networks, most relatively limited in scope, which have helped to address global issues. These full or partial networks have proven remarkably effective, though they are far from solving problems entirely. Focus areas of existing global public policy networks include such issues as landmines (led by the International Campaign to Ban Landmines), corruption (led by Transparency International), the construction of large dams (led by the World Commission on Dams), and debt relief (led by Jubilee 2000). An emerging network (led by the Coalition to Stop the Use of Child Soldiers) is pushing for the adoption of an optional protocol to the U.N. Convention on the Rights of the Child which would end military recruitment of persons under 18 years of age. Another network is forming between the United Nations, international NGOs (led by Global Witness), and DeBeers mining company to prevent the sale of diamonds from funding ongoing conflicts in southern Africa. These models illustrate that power has shifted away from governments acting alone to a system in which state, non-state, and private sector actors work together on the international scene. Overall, however, development of such networks on global issues is spotty and often shallow. The networks frequently lack effective leadership. U.N. participation, let alone leadership, in global public policy networks is a part of the Secretary Generals reform program that has scarcely been implemented. The GPP Project has an impressive tri-sectoral advisory board to guide its work. Global civil society activists, who may be cynical of tri-sectoral partnerships, may wish to note the involvement of Greenpeace and Amnesty International in the Global Public Policy Project. These two reputable institutions of global civil society are well-known for their innovative activism in the areas of environment and human rights, respectively. The involvement of Greenpeace and Amnesty international in tri-sector partnerships highlights the dilemma of global civil society discussed in Chapter 8. For these two institutions are not alone. There are other reputable institutions of global civil society that are involved in TSPs. On the other hand, there are equally reputable institutions of global civil society who are wary of tri-sector partnerships and would rather remain in the criticizing mode. Will these two main streams of civil society support each other or will they try to neutralize each other? What this list of advisory members tells us is that global public policy networks (GPPNs) and tri-sector partnerships advancing these networks are high on the agenda of global institutions that have significant influence in shaping globalization. This only reinforces the earlier observation that TSPs are not only here to stay but will also become increasingly visible in the landscape of global social life. Civil society formations that either distrust TSPs, or favor them while trying to avoid their pitfalls, will have to re-tool themselves to cope effectively with this new social initiative. At the highest policy levels, the GPP Project has perhaps the most sophisticated articulation of the TSP approach. It understands the power of civil society, the cultural nature and source of its power, and the importance of threefolding approaches in addressing urgent global issues and advancing comprehensive sustainable development. There is truly cause for excitement! Yet, when one compares the GPP Project articulation with authentic threefolding policies and approaches, as exemplified in Philippine Agenda 21, there is also cause for concern. GPP Project: An Authentic Threefolding Initiative? The Global Public Policy (GPP) Project mobilizes, not only a competent advisory board, but also consultants knowledgeable in the theory and practice of tri-sector partnerships. One of these consultants is Steve Waddell, who has been studying TSPs since the 1980s. Waddell is an influential thinker on the theoretical and practical issues connected with implementing TSPs. He has been connected with the GPP Project, the World Bank, and the United States Agency for International Development (USAID). It is therefore useful to look carefully at the analytical framework that Waddell uses in advancing tri-sector partnerships and global public policy networks. Here one will note that even in this well-researched, well-intentioned, even admirable articulation of tri-sector partnerships, conceptual shortcomings still existimperfections that can have serious operational consequences. What is an organizational sector? In this case, a sector is not associated with an industry; rather, it is associated with a distinct type of organization. From a sectoral perspective, all organizations in the world are represented graphically in [Figure 174]. Organizations can be classified as either belonging to the state (government), market (business) or civil society (NGO) sectorsor a hybrid of them. Understanding the sectors basic differences and comparative strengths is the basis for building productive relationships between them. Although the focus here is upon business and NGOs, to understand their relationships requires also understanding the role of the state5. There is still considerable confusion about the important differences between the sectors. For example, it is common to think of the legal form is the key distinguishing factor and some people refer to civil society as the "nonprofit" sector. But the legal form of an organization is only one indicator of whether an organization might truly be considered a civil society NGO as some writers have pointed out (Brown & Korten, 1991; Etzioni, 1961; Najam, 1996). [Table 66] proposes a group of characteristics that can indicate the degree to which an organization might be considered an NGO, a business, or a government agency. An environmentalist group that depends upon volunteer membership support for funding and its operations is a classic example of a civil society organization; however, civil society includes labor unions, churches, arts organizations and community development organizations. A good example of a hybrid of the market and civil society sectors (and also the state sector in some countries like India) is with cooperatives that produce goods and services, but have an active membership. However, in most cases an organization has characteristics that place it dominantly in one sector. Before continuing, readers may want to note the similarity between the thinking expressed in the above paragraphs and that of Philippine Agenda 21 (PA21), as discussed in Chapter 14, and the nature of civil society, as discussed in Chapter 9. This similarity indicates that the thinking behind PA21 is capable of taking hold of global realities in a realistic way. There are, however, some differences. One difference is that, in PA21, labor unions are considered part of business, because the dominant activity of labor is within the economy. Furthermore, in the sense of PA21, business is differentiated between owners/managers and labor/staff as two actual empirical groups in the conduct of day-to-day business affairs. There are also, of course, businesses that are owned and run by employees. It is easy to see, however, why Waddell and others would place labor unions in civil society. There are extraordinary situations when labor unions genuinely become civil society organizations, as in the case of Poland, where the issue went beyond wages and included freedom and democracy. However, in the normal situation, labor unions are mostly operated within the context of the economy and are among the entry points for the institutionalization (see Chapter 9) of civil society values. The same kind of reasoning applies to "hybrid" organizations, including cooperatives. In fact, Waddell agrees to the criteria of classifying organizations according to their dominant mode of activity and presence in social life. The figure Waddell uses also has a close, though not exact, affinity with Figure 13 of Philippine Agenda 21 (PA21) as discussed in Chapter 14. 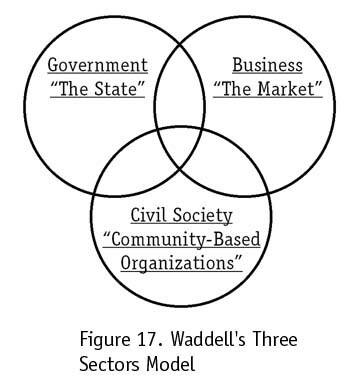 And Waddells ideas, as articulated in the paragraphs that follow, come very close to the PA21 formulation of the origins and role of the three sectors (civil society, government and business) in connection with the three realms of society (culture, polity, and economy, respectively). This is a systems analysis of organizations that says there are basically three different organizational logics or imperatives. This systems analysis sees governments primary sphere of activity is with a political system focusing upon the creation of rules that can be enforced through the (coercive) vehicles of the police and courts. Businesses primary playing field is with economic systems where owners are given pre-eminent power and the principle mechanism to induce people to do what an organization desires is through monetary (remunerative) rewards. In contrast, civil society organizations are seen to focus upon social systems and relationships around values and beliefs; these organizations derive their power from their ability to speak to tradition, community good and valuesa normative power base. Organizations in the different sectors have several other distinctive attributes, one of the most important being how they assess whether an action and its outcome is "good." Derived from its political system focus and coercive power, the state defines actions and outcomes as acceptable by whether or not they are legal; the market sector focuses upon whether they are profitable, and civil society asks the question about whether they are "just," usually based upon implications for inter-personal relationships and basic rights (not always with equality outcomes, as organizations like the Klu Klux Klan and most ultra-nationalist groups demonstrated). It is important to note that these assessments are different for different organizations and societies. For example, the definition of acceptable "profitability" varies between countries and industries; the definition of "justice" varies between issues and groups; and of course what is legal is established by governmental jurisdictions. In some countries, one sector is clearly dominant, such as the market sector in the United States, the civil society sector in Bangladesh, and the state sector in China. This sectoral analysis suggests that the balancing of power between these sectors is a powerful force in determining the "success" of a culture in terms of various outcomes. Or, put another way, the relative development of the sectors influences the range of possibilities that face any country and should be considered when undertaking any macro-interventions or building organizational strategies. Despite these levels of complexity that are associated with the sectors, there does seem to be an emerging consensus that [Table 6] has some universal validity. This is recognized, for example, by new institutions such as academic ones that increasingly distinguish between schools of public administration/government, management/business, and nonprofit/third sector management. This suggests that the sectoral division speaks to some very profound needs and human qualities. Learning to work with these qualities and constructing organizational arrangements that respond to themrather than ones that fight themseems to hold important promise for the creation of more harmonious and wealthy societies that are supportive of diversity. These insights are so consonant with the leading thoughts and premises of Philippine Agenda 21 that even people with moderate experience and exposure to tri-sector partnerships may mistake the two perspectives as virtually convergent. For example, Waddell points to three "logics" or "imperatives" in society and situates the three sectors within these three logics as follows: business within the "economic system," government within the "political system" and civil society within the "social system and relationships around values and beliefs." (See quote above.) PA21 also builds its framework on and approach to sustainable development on a similar observation of social life. Waddells "values and beliefs" system in society is none other than the "cultural realm" or "dimension" of society in PA21. The existence and recognition of the three key actors in multi-stakeholder or counterparting processes . . . point to [a] significant reality: the functional differentiation (not division) of modern society into three realms, interacting with but independent from each other. These three essential societal dimensionseconomy, polity, and culture, are the realms where the key sectors are active and from which the actors derive the substance for their dialogue and interaction with each other. [See Figure 13, Chapter 14.] This image of society animates the vision, parameters, and strategies of sustainable development. Philippine Agenda 21 then goes on to describe civil society as operative within the logic of culture, government within the logic of polity, and business within the logic of the economy. (See quote below.) In addition, PA21 would agree with Waddells observations that in "some countries, one sector is clearly dominant, such as the market sector in the United States, the civil society sector in Bangladesh, and the state sector in China." PA21 wholeheartedly agrees with this important argument for the importance of tri-sector partnerships. The [threefolding] image of society that guides Philippine Agenda 21 characterizes a significant number of modern societies today, some of which recognize that the key actors in any critical and principled partnership or conflict regarding sustainable development are the government, business, and civil society. [See Figure 12 in page 180.] To humanize development, there must be an interplay of market forces, state intervention, and civil society participation. There are, however, subtle but significant differences that can lead to differing operational emphases and to different, and less desirable, results in the case of TSPs being advocated under the Waddell approach. It is likely that Waddells intentions are good, but it is precisely at this point where unexamined assumptions can enter and result in a TSP articulation that can run counter to the very essence of TSPs themselves. For TSPs do not mean business or governance processes as usual. Authentic TSPs mean that all participants learn from each other. And this means, among others things, that civil societys ethical and framework concerns are brought in, which brings about an approach different from the one that results when economic and political assumptions dominate. This is clearly demonstrated in the comparison between Waddells articulation and the concept of threefolding as embodied in Philippine Agenda 21. In his systems analysis, Waddell writes of business as follows. Businesses primary playing field is with economic systems where owners are given pre-eminent power and the principle mechanism to induce people to do what an organization desires is through monetary (remunerative) rewards. Contrast this with what is written in the Principles of Unity of Philippine Agenda 21 and the difference is cause for serious concern. Business is the key actor in the realm of the economy where the central social concern and process is the mutually beneficial production and distribution of goods and services to meet the physical needs of human beings. While Waddell gets the connection between business and the economy, his operational articulation of this relation can easily put consumers on the alert and lead to unsustainable economic activity. In PA21, owners are not given pre-eminent power over others in the economy. Nor does PA21 approve of "inducing" people to behave according to what business dictates through price signals. Rather, in a truly sustainable economy, free (not coercive), principled and mutually beneficial relationships should be established between creditors, producers, distributors, and consumers. Thus PA21 prefers an economics of solidarity and mutual help or "associative economics," where price is only one factor to take into consideration, in contrast to Waddells version of the economyone implicitly organized on the basis of neo-liberal economic doctrines that are of limited value. As we shall see, similar problems surface with regard to Waddells operational understanding of the role of the government in the political sub-system of society. Waddell conceives of governments role in the political sub-system of society as follows. This systems analysis sees governments primary sphere of activity is with a political system focusing upon the creation of rules that can be enforced through the (coercive) vehicles of the police and courts. We can now compare this with the perspective in PA21. Government is the key actor in the realm of polity where the central social concern and process is participatory, democratic governance and rule making to secure the human rights of all citizens including justice and equity. Waddells concept of governments task is too narrow and is focused on the use of coercive power with no clear idea what this power is going to uphold. Also, rules can be created, but it is not clear towards what ends and in what way the rules are to be established. Is rule making going to be participatory or not? Are the rules fair? Who gets to participate? Waddells definition also limits the state to only two approaches, a legalistic approach or a coercive one. While in certain situations these approaches may be appropriate and justified, there should be room for other possible approaches that attain a similar goal. In contrast, PA21 focuses on the essential, positive role of government to ensure that justice and equity prevails in society and that this is achieved through participatory and democratic means. Finally, on the concept of civil society as a cultural institution, Waddell advocates the following. In contrast, civil society organizations are seen to focus upon social systems and relationships around values and beliefs; these organizations derive their power from their ability to speak to tradition, community good and valuesa normative power base. The PA21 perspective on the same subject is as follows. Civil society is the key actor in the realm of culture where the central social concern and process is the development of the social and spiritual capacities of the human beings in order, among others, to advance the frontiers of knowledge, to achieve clarity and coherence of values and to advocate the public interest. While the operational difference is less pronounced here, it is still significant. Waddell recognizes the cultural power of civil society, which he calls the "normative power base." Yet, he sees only a limited use of this "normative power" in the defense of tradition, community good, and values. He does not understand the positive aspects of this cultural power and the role that civil society plays in the reproduction of the deep structure of culture, the articulation of a synthesis between tradition and modernity, and the ennoblement and actualization of the deepest reaches of human potential. This comparative analysis between PA21 and some of the leading edge thinking on TSPs and aspects of threefolding, illustrates the importance of a thorough understanding of civil societys origins in cultural life and the substantive aspects of authentic threefolding. In authentic threefolding, it is not enough that the three sectors are there. One has to clearly understand why they are there and what functional realms of society they articulate. In addition, one has to examine the economic assumptions of the business sector, the governance assumptions of the government sector, and the worldview and value assumptions of civil society. Furthermore, these differing assumptions have to be authentically harmonized. If not, tri-sector partnerships can become a deadly trapa tri-sector process that actually advances the agenda of elite globalization. In a surrender of substance to process, civil society participants betray their own tasks and the confidence that their colleagues and larger society have placed in them. One can empathize with CSOs involved in tri-sector dialogues and/or partnerships. Theirs is a very difficult situation. For, in practice, one of the most important ways to advance authentic threefolding and comprehensive sustainable development is to actually ensure that tri-sector representation and dialogues, even debates, are taking place. This is understood and respected. But TSPs are to be understood only as beginnings, as entry points, to the larger objective of advancing authentic threefolding processes and substance, which in turn, are only means to truly advance comprehensive sustainable development. If one stops at the process of the dialogue and the partnership, without including the substantive operational details about how the economy should really be organized, how good governance can be ensured, and so on, then one has stepped into the arena of co-optation. This is especially necessary for civil society when it critically engages government and business in tri-sector partnerships. After all, and with due respect to exceptional individuals in government and business, it is civil society that has been most concerned with taking globalization in a more sustainable, equitable, and spiritually fulfilling direction. And it would be tragic if the true tasks of civil society are drowned in the quagmire of a tri-sector process that does not allow the real substance of all three realms of society to guide the meaning and direction of the tri-sector process. In short, tri-sector dialogues and partnerships are important first steps, but they are only first steps. The TSP process should then move into threefolding or tri-sector substance considerations if it is to continue on the path of authentic threefolding in service of comprehensive sustainable development. It is important to bear this in mind as we now take a look at the United Nations intention of mainstreaming its global public policy network approach involving tri-sector dialogues or partnerships at the U.N. Millennium Summit. U.N. Millennium Summit: A Watershed for Tri-Sector Partnerships? Leading officials at the United Nations are promoting TSPs at the very core of the U.N. structure itself. They want tri-sector partnerships to be at the heart of the UNs new approach to governance. And there is a considerable chance that TSPs in conjunction with global public policy networks (GPPNs) will be formalized throughout the U.N. system. On 17 December 1998, the U.N. General Assembly adopted resolution 53/202 where it decided to convene the Millennium Summit of the United Nations ("U.N. Summit") as an integral part of the Millennium Assembly of the United Nations. The U.N. Summit will be held from 6 to 8 September 2000 and will explore the role of the United Nations in the 21st Century. More than one hundred eighty (180+) heads of states or governments are expected to attend this historical gathering, the biggest of its kind in world history. The U.N. Millennium Summit will focus its discussion on the role of the U.N. in the age of globalization. In adjusting itself to current world realities, the U.N. is proposing a re-conceptualization of global governance in order to give globalization a "human face." This re-conceptualization already has some features of threefolding ideas, even if imperfect. This is clearly seen in the Report, "We, the People" submitted by Kofi Annan, U.N. Secretary General, to the U.N. General Assembly in March 2000. The U.N. Secretary Generals Report will be the basis for the discussions of world leaders at the U.N. Summit. In this Report, Kofi Annan stresses the importance of "global public policy" networks in addressing world problems spawned by globalization. The term, "global public policy networks," as we have seen, is the technical language used by the U.N. to describe tri-sector partnerships between civil society, government, and business. A few excerpts from his Report and official U.N. press statements demonstrate the important role that this concept will play in the U.N. Summit and beyond. Underlying these diverse expressions of concern [especially and powerfully expressed by the "battle of Seattle" during the meeting of the World Trade Organization (WTO)] is a single, powerful message: globalization must mean more than creating bigger markets. The economic sphere cannot be separated from the more complex fabric of social and political life, and sent shooting off on its own trajectory. To survive and thrive, a global economy must have a more solid foundation in shared values and institutional practicesit must advance broader, and more inclusive, social purposes.
. . . if we are to capture the promises of globalization while managing its adverse effects, we must learn to govern better, and we must learn how better to govern together. The Millennium Summit, therefore, takes place at a compelling moment, not merely in symbolic but also in practical terms. What do we mean by "governance" when applied to the international realm? What are some of its desirable attributes if our aim is to successfully manage the transition from an international to a global world? Better governance means greater participation, coupled with accountability. Therefore, the international public domainincluding the United Nationsmust be opened up further to the participation of the many actors whose contributions are essential to managing the path of globalization. Depending on the issues at hand, this may include civil society organizations, the private sector, parliamentarians, local authorities, scientific associations, educational institutions and many others. . . .
Press releases from Kofi Annans office reinforce the UNs advocacy for global public policy networks that operate through tri-sector partnerships. Kofi Annan has demonstrated his seriousness in expanding the concept of "governance." In May 2000, he hosted 1,350 civil society organizations at U.N. facilities (including use of the General Assembly Hall), at a forum to propose ways of addressing the challenges of globalization. The leaders of these civil society organizations met in a "Millennium Forum" to produce a statement for consideration by the heads of state or government during the U.N. Summit in September. The protest by a coalition of unions and NGOs at the World Trade Organization conference in Seattle in December, 1999, and at the World Bank and International Monetary Fund conferences in Washington, D.C. in April, 2000, highlights both the inadequacies of the current system of global governance and the imperative to establish a more inclusive consultative mechanism by which major stakeholders can come together to deliberate on global issues; discern common objectives; and work on common problems. . . .
At the beginning of the 20th century, national governments were the primary actors on the world stage. At the beginning of the 21st century, governments share the stage with two non-state actorsthe business community and civil society, increasingly well organized and articulate. This presents unique challenges to the institutions of global governance which, almost without exception, were designed exclusively for representatives of sovereign states. . . . .
With this in mind, SWF is convening a meeting of global leaders of civil society, business and government parallel to the U.N. Summit. SWF describes this event as follows. It is to this challenge [of a new system of governance] that the State of the World Forum has committed itself in this millennium year. Working with partners worldwide, the Forum will convene a high-level gathering of international leaders of business and civil society in New York September 4-10, 2000, timed to coincide with the historic United Nations Millennium Summit . . . the largest gathering of government leaders in modern history. The intent of the State of the World Forum and its partners in juxtaposing Forum 2000 with the U.N. Millennium Summit is to convene a "global town meeting" in which the private sector and civil society can come together for substantive dialogue with selected Heads of State concerning the great issues confronting humanity as globalization takes hold and affects us all. The centerpiece of Forum 2000 will be a post Seattle dialogue on Shaping Globalization: Convening the Community of Stakeholders. . . . . The Forums convening Chairman, Mikhail Gorbachev, will open the conference with a plenary discussion on Globalization and the New World Order, to which he is inviting a spectrum of world leaders; Sir Sridath Ramphal, Co-Chairman of the Commission on Global Governance, will chair a session of world leaders on The Future of Global Governance; McKinsey & Co. and Heidrick & Struggles are providing leadership in bringing senior business executives, economists, and representatives of international financial institutions; the AFL-CIO, United Steelworkers of America, Textile Workers Union and their international counterparts are bringing the most articulate voices of the trade union movement; the Synergos Institute, Free the Children, Ashoka Innovators for the Public and the Earth Council, among others, are convening grass roots activists, civil society leaders, and critics of current policies on globalization; and the Alliance of Religion and Conservation is convening representatives of the eleven major world religions. Negotiations have been initiated with numerous Heads of State to ensure their participation. Discussions are in process with upwards of one hundred other institutions worldwide. SWF intends the event to have global reach. BBC World Television and Time Magazine are participating as strategic media partners in Forum 2000 and will be covering portions of the event for their respective audiences worldwide. A comprehensive global webcast will be undertaken, in order that citizens worldwide can access and comment on the proceedings. SWF also intends to institutionalize initiatives beyond Forum 2000. These include convening tri-sector dialogues beyond Forum 2000 and the establishment of a Global Leadership Council for Responsible Globalization. The proposed Council is intended to provide the ongoing capacity for further multi-stakeholder dialogues in the U.S. and other regions of the world. SWF envisions this Council to have the following role. Such a Council would seek to fill the vacuum that presently exists because the prevailing international institutions do not have the mandate to bring the major constituencies affected by globalization into dialogue with each other. The fact that this initiative is coming from the civil society sector with backing from representatives of all the major constituencies is indicative of not only the timeliness of the idea but the emerging role of civil society in issues pertaining to global governance. Meanwhile, according to Jim Garrison (President of SWF), 30 heads of state or government have already confirmed their participation in Forum 2000. Furthermore, Garrison stated that Kofi Annan will also convey the ideas of Forum 2000 to the government leaders attending the U.N. Summit. In addition, dozens of CEOs, including those belonging to Fortunes 50 top corporations, have confirmed their attendance. In all, more than 1000 leaders from around the world are expected to attend Forum 2000. Clearly, a historical opportunity exists to advance threefolding substance, concerns, and processes at the highest decision making levels in business, government, and civil society. This opportunity is further amplified by the thousands of media personnel who will surely cover the U.N. Summit and the Forum 2000. These opportunities are especially urgent when one considers that the understanding of threefolding by both the U.N. and SWF is at an early stage and can be diverted, consciously or unconsciously, to inaccurate and inappropriate forms of expression. Civil society networks are alerted to the significance of the U.N. Summit in shaping the direction of globalization in the years to come. They are organizing towards a meaningful and significant presence in New York during the coming U.N. Millennium Summit, Forum 2000, and the events of global civil society that will surely accompany the Summit. The presence of civil society, well versed in the nuances of authentic tri-sector partnerships, can reinforce healthy tendencies towards threefolding and expand its internalization both within civil society and in the U.N. Summit and Forum 2000, and beyond. The U.N. Summit will give global civil society a foretaste of what is to come. Encouraged and emboldened by an increasingly large number of similar mainstream initiatives, the U.N. is pursuing its ideas of global public policy networks and tri-sector partnerships. For in reality, the developments at the U.N. are a prominent symptom of a social juggernaut to which global civil society as a whole will soon have to respond, the juggernaut of tri-sector partnerships.